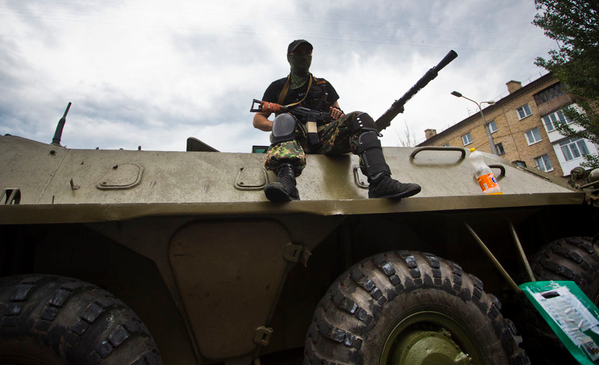 The situation in the ATO zone is relatively calm. At the same time, militants continue accumulating forces and supplies in the vicinity of Spartak and north of the settlement, as well as in the area of the Donetsk Airport [DAP] (Donetsk-Pivnichnyi, Pryvokzalna street, Novoihnatyivske cemetery, DAP’s fire department, and other locations). In these areas, a rapid increase in the numbers of enemy personnel and armaments (including AGS-17 and SPG-9 “Kopye” grenade launchers) is observed. Up to 600 militants, split into 4 groups, arrived to these areas. North of Mar’inka and in the vicinity of DAP, militants opened small arms fire several times over the past 24 hours, both from the neutral zone and from their positions. Militants are transferring their personnel from the direction of Pervomaisk towards Kirovsk, on board of trucks and buses escorted by ACVs. This transfer is part of the rotation of armed gangs that had been shelling the ATO forces positions near Popasna, Katerynivka and Orikhove over the course of the past months. Notably, as rotation goes on, terrorist units are replaced by units of smaller strength, due to lack of personnel at the disposal of the Russian-terrorist troop command.